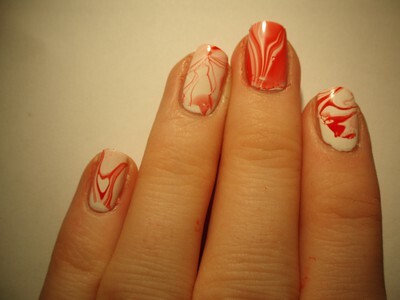 This is a red and white water marble done with Flormar 321 and Alix Avien 60. All of the nails turned out rather different from each other but I kind of like them, especially the pinkie which looks like a heart. I have finally got a new nail art! A Babushka doll/Russian nesting doll. I Used H&M Blue My Mind as a base for all nails except my long finger where I used H&M Happy Grey, I also used Happy Grey for the dots on the other fingers. 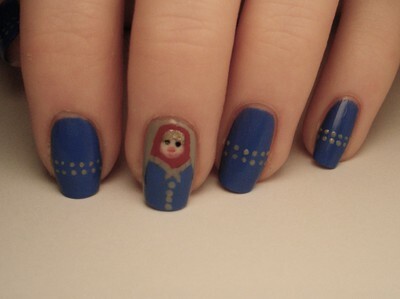 For the Babushka I used Blue My Mind, Happy Grey, She Nail Sugar 504 and Flormar 321. I thought that I should explain my long absence from this blog, I wasn't planning on disappearing for over a month, but due to a lot of work and me being sick most parts of December I completely lost all inspiration and will to paint my nails. Now I feel like painting my nails again, and hopefully I will have some new nail art to show you really soon!